Οn Thursday the 25th of October 2018 the "Destination of Sustainable Cultural Tourism 2018 Awards” were announced in Pafos, Cyprus, at a ceremony during the 11th International Conference for Cultural Tourism. 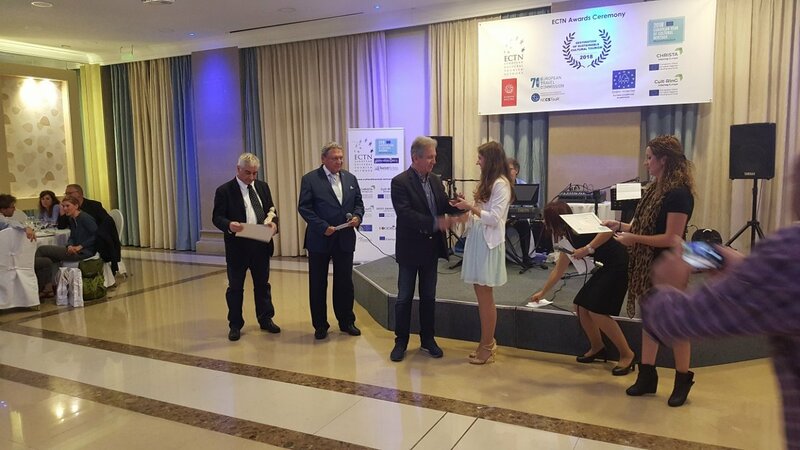 The project “Creation of a cultural dipole in the cross border area” with the acronym “CULTURAL DIPOLE”, which is funded by “Interreg V-A Greece-Bulgaria 2014-2020” Cooperation Programme, won the second prize in the category "Transnational Thematic Tourism". In the ceremony participated: the Mayor of Serres, Mr. Petros Aggelidis and prof. Aristotelis Naniopoulos, scientific coordinator of the project for AUTh. The main objective of CULTURAL DIPOLE project is the implementation of two Museums in two abandoned military camps in the cross border area, the “Constantin Xenakis” Museum in Serres, Greece and the new Historical Museum in Petrich, Bulgaria. The long-term goal is the transformation of the former military camps into cultural parks which will host museum spaces and activities of Pan-European interest. The project partners are: Municipality of Serres (Lead Beneficiary), Municipality of Petrich, Aristotle University of Thessaloniki (AUTh), Democritus University of Thrace (DUTH). The “Serreon Politeia” Society and the Society for the “Study and Research of the Serres Region History” act as supporters of the project. The award contest was organised by the European Cultural Tourism Network (ECTN) in cooperation with Europa Nostra and European Travel Commission, supported by the Network of European Regions of Competitive and Sustainable Tourism (NECSTour). In total 57 candidates from 15 countries had submitted applications, under 7 thematic categories. The implementation of the contest is a contribution to the European Year of Cultural Heritage (EYCH2018), initiative on “Tourism and heritage: responsible and sustainable tourism around cultural heritage”. EYCH2018 aims to encourage more people to discover and engage with Europe's cultural heritage, and to reinforce a sense of belonging to a common European space.